A few weeks ago I was thinking how cool I was going to the midnight showing of Alice in Wonderland on opening night. I thought that The Nightmare Before Christmas was genius and I was positive that Alice would be one of Tim Burton’s greatest movies. I met my cousin at the theater and people were dressed like the Mad Hatter, Alice and the Red Queen. As the lights went down everyone started clapping. However, the movie ended up being a complete failure. Even Johnny Depp and Anne Hathaway were disappointments. The movie is a sequel to the Disney cartoon version of Alice in Wonderland. It starts with Alice as a little girl telling her daddy that she had a nightmare, in which she saw a talking cat, a rabbit with a clock and a blue caterpillar. Her dad cheers her up by telling her it was only a dream. The movie resumes when Alice is an adult. Alice goes to a party without knowing that it’s her engagement party. Alice’s mother tells her that a wealthy man named Hamish is going to propose to her and that she must accept his proposal. Just as Hamish proposes, Alice sees a white rabbit pointing to his clock. Although she doesn’t seem to remember him she gets curious and chases after it. It’s then that she falls inside a tree into Wonderland. As she tries to find her way back home she comes across the rabbit with the clock, which is the White Rabbit, a small talking mouse known as Dormouse, and two twin boys known as the Tweedles. As they examine Alice, the white rabbit says he has finally found “the right Alice.” He claims that only the real Alice can slay the Jabberwocky and save Wonderland. They tell her that she must go to the Red Queen’s castle to get a special sword to kill the dragon. She gets scared and tells them that she is just an Alice from London with no ability to slay a dragon. Later she becomes friends with a crazy man known as the Mad Hatter, played by Depp, and eventually decides to save Wonderland. 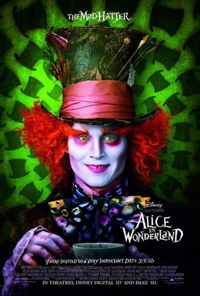 Depp’s performance as the Mad Hatter felt like I was watching Captain Jack Sparrow or Willy Wonka again. As for Anne Hathaway’s performance as the White Queen, I felt she over did it. She seemed so fake. Her hand movements were so ridiculous. It was as if she were trying to catch an invisible fly. On her quest Alice finds out that the dream she had when she was little wasn’t a dream but what happened to her the first time she visited Wonderland. The effects were great, like when Alice falls into Wonderland and when Alice gets chased by a creature called a Bandersnatch. The Bandersnatch looked very real and scary. But the story is what threw me off—there was too much action. The cartoon had a lot of fantasy. You couldn’t imagine the Wonderland in the cartoon version without being weirded out. While in Burton’s version needed more unrealistic things and more creatures where you just can’t believe your eyes. I prefer the original Alice in Wonderland. The cartoon Alice was much easier to understand. This movie was 1 hour and 48 minutes long, but it seemed like forever. A couple of people clapped in the end, but not as much as when it started. In the end I guess the clapping meant HOORAY! THE MOVIE IS FINALLY OVER!